The Armenian Language poster is an attractive visual tool that summarizes the historical journey and provides a brief description of the language. 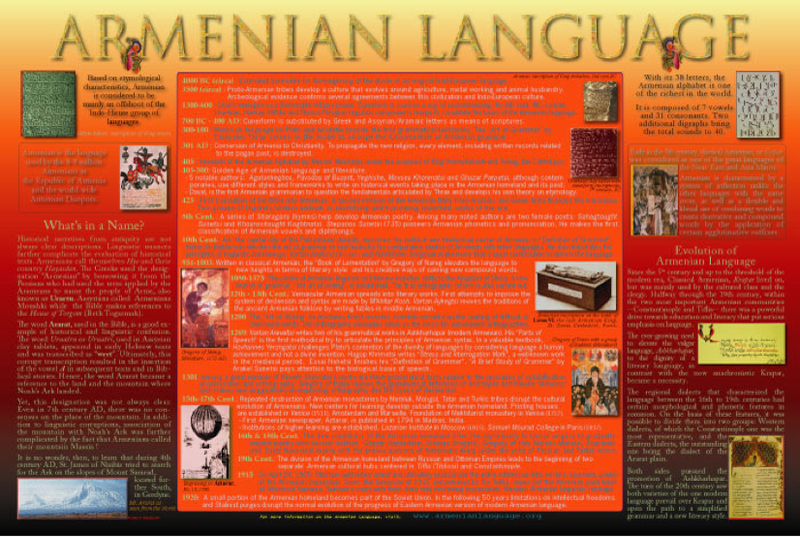 On the central panel is a Timeline that narrates the itinerary of the language from its origins to the present by highlighting important events and/or significant contributions made by Armenian linguists or grammarians. The editorial content of the poster, presented under different headings or windows, contains general information that is deemed relevant to linguists or students of languages who wish to be informed about the Armenian language. The illustrated poster measures 36"x 24" (60x92 cm) and includes photographs, text and graphics. It is conceived and designed to convey information on many of the fundamental components of the language by providing readers a catalyst for further exploration and study. If you wish to purchase a copy of the poster ($15 per copy plus $5 shipping and handling within the United States), please contact: poster@armenianlanguage.org.